Plazes.com is a Web 2.0 social networking site which uses maps to help you track the location of friends and find new people you might want to contact. You can choose to show your location (the place you work, or the actual place where you are). You might want to show which bar you hang out at for example. The developers of this site recently got together with some folks from the Google Earth team and quickly turned around an implementation of their data for Google Earth. Simply download the Plazes.com KML file . Since they are using network links you are able to view the data update dynamically. They also use the photos from participants as icons for the placemarks showing their locations. A click on the placemark gives you a larger photo (if provided) and basic information such as name, a description of their location, and a link to contact them through the web site. 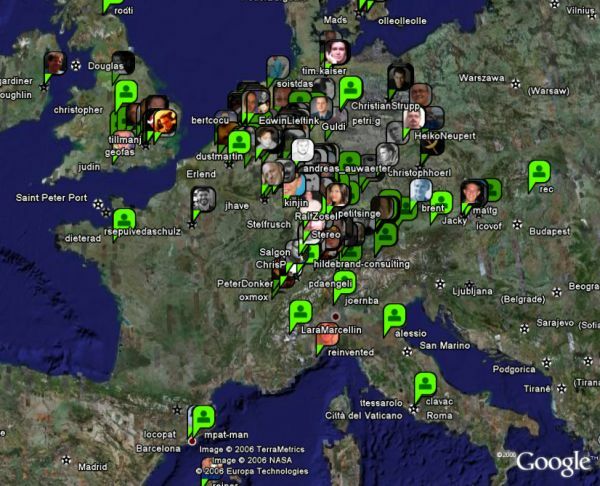 This is probably the best implementation for a Web 2.0 social network for Google Earth I've seen so far. Although, the response from the server seems a little slow this morning. Previously I had written about the TheCity Local (a dating service). A similar social mapping site has been out for several months called Platial. They also have support for Google Earth.